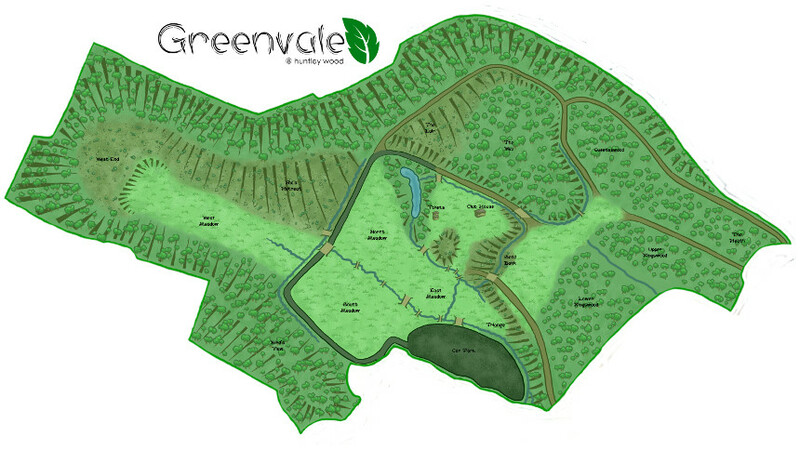 The Greenvale is the largest of the three sites at Huntley Wood, approximately 70 acres in size. It is dominated by a wide, grassy valley which provides a substantial camping area capable of accommodating large groups. The surrounding wooded areas are threaded with numerous narrow paths and small glades. The Greenvale is equipped with toilet & shower facilities and our Oak frame Club House which has a log fire, internal Oak beams and other traditional features, a very special indoor space, suitable for lectures, banqueting and other similar activities. The Greenvale has a large, flat camping area capable of accommodating groups of up to 500 or more people. Its substantial car park can easily park over 300 cars, with overflow parking available if necessary. The Greenvale is approximately 70 acres in size. It has approximately 10 acres of large flat open camping fields suitable for several hundred tents. It also has wooded areas and forests with paths and tracks. The Greenvale is suitable for all size groups from intimate private parties to large 500+ people gatherings. Our prices are fully inclusive of exclusive use of the venue hired, services including water, gas and electricity, waste removal, building cleaning and VAT. The Greenvale has a large flat car park which can accommodate up to 300 cars, with overflow parking which can provide parking for a further 200 cars. There is also electricity points on the main car park for visitors with caravans or campervans. The Greenvale has permanent toilet and shower facilities built to and maintained to a very high standard. They comprise of 13 toilets, 6 urinals, 5 showers and 13 sinks. Extra temporary toilets and showers can be provided for larger groups. Our Beautiful Club House is the “Oak Barn”, an oak-framed building which provides indoor space for sleeping or activities. With a log fire, bar and plenty of internal beams and other traditional features, this is a very special indoor space, suitable for lectures, banqueting, parties and other similar activities. The Greenvale will be equipped with disabled toilet & shower facilities and wheelchair-accessible Club House. The Club House contains a permanent fully licensed bar run by Huntley Wood, which is available to customers for events and activities in The Greenvale. Alongside the Club House will be a fully equipped kitchen facility. This will be available for use by customers, caterers or can be operated by Huntley Wood. We have strategically placed drinking water standpipes throughout The Greenvale. Due to cold weather, Standpipes are not available during the winter months.